In 1957, Dr. Sinclair, a man from South Africa came to Palmer and brought with him a rugby ball to keep himself in shape. Dr. Sinclair was a rugby major league all-star in Africa. Later, Drs. King and Whatu began working out with Dr. Sinclair. 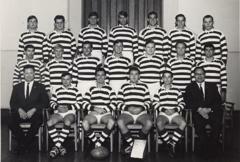 Dr.King, a native of New Zealand, was the man that initiated the oranization of the first rugby team at Palmer in 1960. The first team played about 10 matches and Dr. Louw was an outstanding member of the first team. Soon after this first year, the team increased their matches to about 30 per season and Dr. Louw graduated from Palmer, became a member of the faculty and became coach of the rugby team. 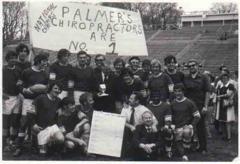 Palmer dominated collegiate rugby in the 1970's winning national titles in 1972, 1973, 1978 and 1979. The teams won countless games against the best college teams across the United States. Regular tours to Canada, the Midwest the Southern states as well as the Southwest helped the club develop it's reputation as Chiropractic ambassadors as they developed their motto "spreading the word of Chiropractic through athletic excellence". 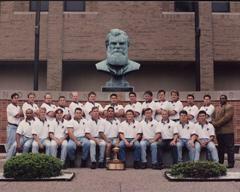 After dominating at the college level through the first twenty years, the team was asked to move to the club level of USA rugby. Palmer continued to travel the country playing rugby and winning tournaments in Pebble Beach, Tucson, Alabama, the Midwest, Las Vegas and more. They continued to garner national attention when the Wall Street Journal featured the club in an article titled: Bone-Jarring games mark rugby rivalry. Palmer success continued in to the 90's. Touring, traveling and competing at the highest level. The 1995 squad was the first to make it to the Division I national championship weekend after dominating the Midwest over the season. 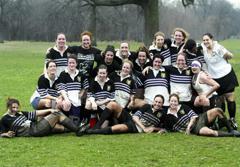 When Dr Tracy Francis-Nguyen came to Palmer in 2003 there was not a women's rugby club. Through Dr. Francis-Nguyen’s efforts a club was established and play began in the spring of 2004. The women compete at the Division II level and have continued a steady rise of competitiveness over their first decade. The first scholarships were implemented in 2010. In 2001 the men's club made it's first trip back to the Division I Final Four since 1995 and have won four Midwest Championships. The men's team made three straight trips to the Division I national championships in 2010, 2011 and 2012 while the women continue to improve their competitiveness at the women's Division II level and winning four straight All Iowa rugby tournaments from 2012-2015.